Images - Why Are Virtual Worlds So Desolate? ou may not recognize his name, but chances are good you’d recognize his face. Tom Atkins has been acting in feature films since his theatrical motion picture debut in 1968’s The Detective (starring Frank Sinatra). Since then, he has appeared in scores of films and TV programs, as well as numerous stage productions. On television, he has lent solid support to James Garner on The Rockford Files series and subsequent telefilms. 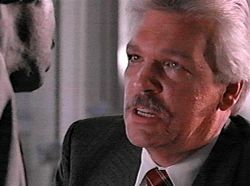 While playing a variety of roles in a host of vehicles, ranging from Shakespearean productions to exploitation thrillers, and everything in-between, Tom Atkins has forged an impressive and eclectic body of work. Always a dependable performer and a strong presence on screen, Atkins has probably become best known to filmgoers who enjoy movies of the offbeat and the fantastic. 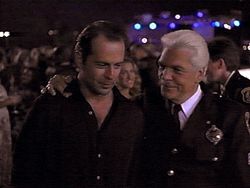 Horror and fantasy film genre fans will no doubt fondly recall the actor’s memorable performance as Detective Roy Cameron in Fred Dekker’s Night of the Creeps (1986), but he’s also done excellent work in a number of mainstream television and theatrical film productions. Atkins is currently living and working in his hometown of Pittsburgh, Pennsylvania. In this recent interview, conducted in October, ’97, Mr. Atkins took some time out (while appearing in a play at the Pittsburgh Public Theater) to answer a few questions about some of his film work to date. Your first theatrical film role was in The Detective (1968) with Frank Sinatra. How did that come about? Well, I was in New York, and I auditioned for it. I played Harmon, a rookie, and I had one scene with Sinatra where he was questioning me in the squad room, as I recall, and asking me why I shot and killed a number of black guys in a car, after a routine traffic stop. So, I did work with him, and it was a good scene, I thought. And not a bad movie. And he (Sinatra) was very professional, although not very personally accessible. And why would he be? I do remember an interesting thing that happened. When we were there, he was called to the set by the first Assistant Director, and the first AD went to his trailer and said, "We’re ready" – we were in New York shooting on location – and he said, "We’re ready, Mr. Sinatra." He came to the set, and had to wait 20 minutes before they actually started shooting anything with him. So, the next time the AD went to his trailer and said, "They’re waiting for you on the set," he didn’t say anything at the time. But the next time the AD went to his trailer, knocked on it and said, "They’re ready for you on the set, Mr. Sinatra," he said, "I’ll be there in 20 minutes." And the AD said, "But they’re ready for you now," and Sinatra said, "I’ll be there in 20 minutes." So, they never called him again after that, unless they were absolutely, totally ready for him to work. But I thought he was a terrific guy – he sent everybody, afterwards, a personalized, leather-bound shooting script of The Detective. I tell ya, it was a great first experience for me. I enjoyed it. You played Lt. Alex Diehl on The Rockford Files TV series, and you’ve reprised this role in the recent made-for-TV films. Did you enjoy working with James Garner? That was great fun. I think I did six or seven of them, and I had a wonderful time. Jimmy Garner is a very gracious guy, as he was then and he is still today. We’ve all aged some, but I just did, this past summer, another Rockford Files movie with the whole gang out there, Joe Santos and everybody else. I think it’s called "If It Bleeds, It Leads" and hopefully it won’t be the last one, though I think Jim thinks it might be. He’s feeling a little old, and also feeling as if CBS didn’t pay enough attention to the movie-of-the-weeks as we were doing them these past couple of years. But I certainly hope it’s not the last, ‘cause we all had a great time over many, many years of doing these things. And he’s a wonderful core, center, for all of us to gather around and do good work around. I'll miss them if they’re finished. In 1980, you played Sergeant Krebs in a peculiar but interesting film called The Ninth Configuration, written and directed by William Peter Blatty. Ah, yes, The Ninth Configuration, or Twinkle, Twinkle, Killer Kane, depending on which coast it was released, for what week. It didn’t open and run long. Well, the whole experience was pretty incredible. None of the studios wanted to do the movie as Blatty had written it, though he made a lot of money from The Exorcist (1973). I think the movie script that Blatty wrote was a lot better than the movie that Blatty, the director, somehow ended up getting onto the screen. Stacy Keach came in as a replacement – one of the little side things on The Ninth Configuration – as a replacement for Nicol Williamson. Another actor in the film, Scott Wilson, replaced Michael Moriarty. Moriarty had been kind of a religious godchild of Blatty’s for a long time, and they – Moriarty and Blatty – had prepared to do that movie for about three years. When they got over to Hungary, after a week of rehearsing and getting ready and all set up, they got ready to shoot the first scene, and Blatty said, "Action!" Moriarty said, "You know, I don’t think I’m quite ready. We need to talk this over a little bit more," and Blatty said, "We can’t. We’ve talked, and we can’t talk any more. It’s time to do it now. Everybody’s here; we need to do it." Moriarty was having, I don’t know, personal demons chasing him around, and he ended up getting fired the first day, in the first hour of the movie. In Lethal Weapon (1987), you played Michael Hunsaker. Is the atmosphere on director Richard Donner’s sets as relaxed and fun as I’ve heard? Oh, God, yeah. That got me work for about four years after that. That was such a big movie. I think everybody in the world saw it at least two or three times. The nice thing about Michael Hunsaker was I only had two scenes in the movie, but they talked about Michael Hunsaker a lot, and it was my daughter, unfortunately, who was going out the window at the beginning of the movie. Richard Donner was a particular delight. He’s a wonderful kind of old-fashioned director, from what I would have thought the golden days of Hollywood must have been from the ‘30s and ‘40s. He was just a big, handsome, strapping, strong, delightful, cigar-smoking, very open, gregarious guy. He would talk to anybody. He never closed off the set. When we were on location at Palos Verdes in the scene where Gary Busey shoots me from the helicopter coming up above the cliff, people from all over the neighborhood just wandered into the yard and on the set, and Richard Donner would light up a cigar in-between takes and shoot the breeze with them. Asked them who they were, what they did, and what they were doing, did they get a kick out of watching the movie, what did they think of Mel Gibson – oh, just a delight. It was a delight. There was a moment there during that scene – it was supposed to be a memorial to my dead daughter and there were a lot of mourners out in the backyard and there was about 75 feet, I guess, from the back of the house to the edge of the cliff, right up alongside of which came the helicopter. 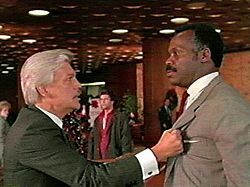 Not too long before that, Vic Morrow and a couple of kids had been killed in the production of The Twilight Zone – The Movie, and the extras who were playing the mourners out in the back yard of this scene in Lethal Weapon were very concerned with the helicopter going over them, flying over them. They organized a mini-rebellion on the set and were going to strike and not do the scene. Donner just had a fit and went ballistic, and then calmed down, and then reassured them, as the helicopter pilots and stunt gaffer also reassured them, that the danger, the main danger from helicopters going over people was when they hover. It is in the hovering function of a helicopter when it is most fragile. But this helicopter came up and hovered off the edge of the cliff, and then flew over the crowd and down the other side of the cliff. And they felt better about it, and we went on and shot the scene. Mel Gibson was lovely. He was on the edge of both scenes that I had with Danny Glover. Nice guy, pretty warm, cheery, easy-going. Kept a little portable trampoline with him, and he would jump up and down all the time when he was outside of his trailer, to keep his body in shape. The atmosphere on Richard Donner’s films, I believe, are incredibly relaxed and fun. He would have champagne on the set, at the wrap, every Friday. He only shot Monday through Friday. Saturday and Sunday were off. If you were around at the wrap on Friday, you just sat around, drank champagne, shot the breeze. And eventually went home. He also invited everybody to watch the dailies after the wrap, after shooting, every day. I thought he was wonderful for that. He had no secrets. He didn’t have any furtive motivations. Everything was very open with him, and everyone was welcome to the dailies. Your wife could come to the dailies. He had everybody. It didn’t matter. He believed that if you felt that you saw something there that could help your performance the following day, make it a little better or something, more power to you. If you didn’t, that was ok, too. I think he genuinely enjoys making films, and it’s very contagious, and everyone around him, I think, feels the same way. I would say an opposite is John Carpenter. The Fog was a lot of fun, but I think he got more and more unfun as he went on. In 1993, you appeared as "Uncle Fred" in the Bruce Willis vehicle Striking Distance. What was that experience like? I enjoyed the work. I just felt that Bruce tends to want to take over everything and direct the movie, do the costumes, act for you if he could. He’s a very forceful presence, but I have the feeling that the movie that Rowdy Herrington wrote did not get on the screen. I think that it could have been better, and I don’t think Bruce helped that movie as much as maybe he thought he was helping it. But it turned out to be decent, I guess. I don’t know if it made any money. I don’t know what Rowdy has done since then, if anything. I know it was not a happy experience for him. It was a difficult shoot. I guess the weather didn’t help, but I don’t think Bruce helped a whole lot, either. But, it was a job, it was a payday, and I was home [in Pittsburgh], and I enjoyed that. You know, they just don’t make big movie stars the way they used to, maybe because the system has changed, the studio system, but it’s sad to see people like Jimmy Stewart go, all the giants of the past. Though I think guys like Tim Roth and Sean Penn are wonderful, young, vital actors, I don’t feel the same kind of respect or awe of them as I did of people like Paul Newman and Gregory Peck and Humphrey Bogart, Jimmy Stewart. Go to frames version of this article. Go to Images welcome page.